Try out your program in-store with Shopify POS. See how your loyalty program works through your POS - Add a customer, reward loyalty points for spend, and redeem a reward. It's a good idea to get all checkout staff to do a couple of practice runs using your loyalty program through your Shopify POS. That way, when it comes to real customers, they will be more confident and are less likely to have uncertainty. 💡Quick Tip: Add enough products to the sale so that you will earn enough points to redeem a reward later. You will be added to the sale as a customer. You are now a loyalty program member and will have earned points for your purchase. If you have your Earned Points email turned on, you will also receive an email notifying you of the points you just earned. 1. 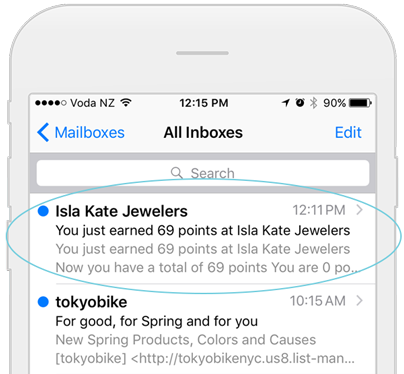 If you have your Earned Points email enabled, in your Email inbox, open the email. 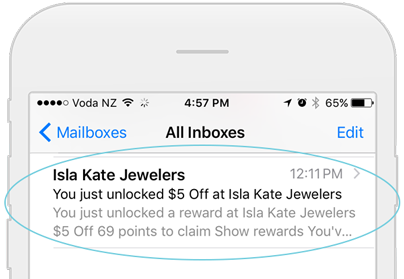 If you have earned enough points to unlock a reward, and have your Reward Unlocked email enabled, you'll receive a notification that you have earned enough points to redeem a reward. To redeem, follow the steps below. The discount will automatically be applied to the sale and the required points will be removed from the member's account.